I had not seen the full, uncut version of official NASA footage of the re-entry, splashdown and recovery of the Apollo 13 astronauts. 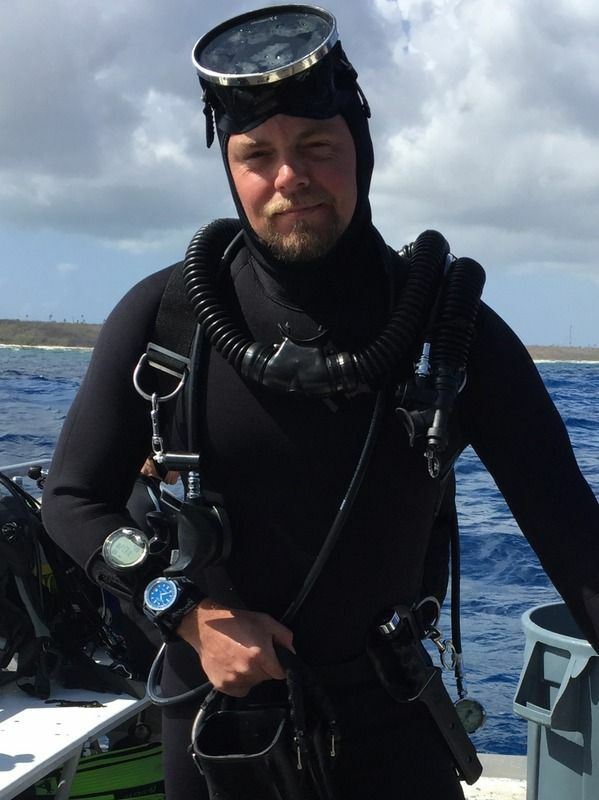 The recovery, including attachment of the floatations collar, was done by U.S. Navy SEAL personnel. I was in the USAF, but did not see this live as we were boarding our HC-130 for a flight to California from Florida, in order to do a "Duckbutt" mission for Air Force One, carrying President Nixon to Hawaii to greet the astronauts upon their arrival on USA soil. Enjoy! John, very looking forward to seeing this We'll watch it tonight! Yup, Happy New Year to you all and this will make for some great viewing on a laid-back, New Year’s Day. --We would first deploy the ADDRS kit (Aerial Delivery Drift Reduction System kit). 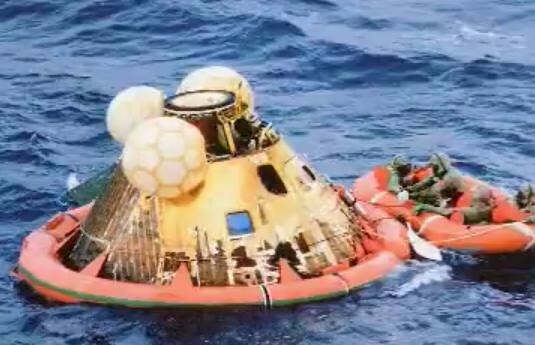 The Apollo had only about a six-inch (15-16 cm) depth under the water. It therefore was very subject to wind drift. The ADDRS was dropped at 90 degrees in front of the Apollo capsule, and cansisted of two bundles, separated by about 500 feet of floating line. The first bundle was dropped by the jumpmaster just before getting to the capsule's drift line, and line deployed out of a deployment bag, which pulled the second bundle out of the aircraft after 500 feet of deployment (just guessing about the 500 feet--I think that's right, but based upon 45+ years of memory). 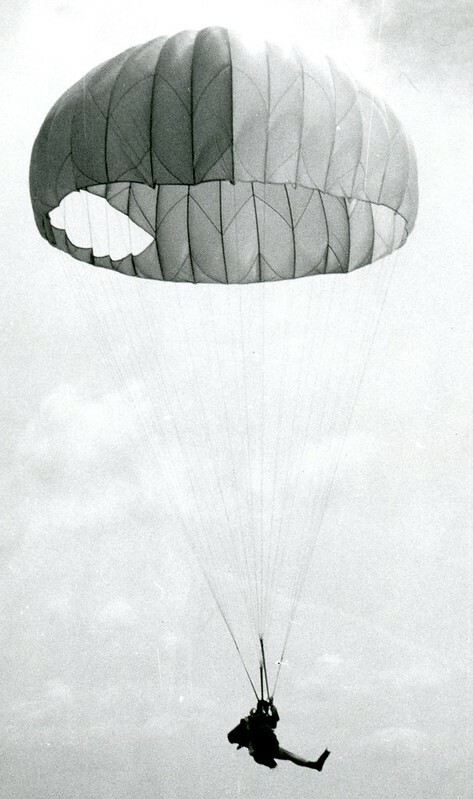 There was a small parachute on each bundle, and these parachutes acted as sea anchors. The line, when the capsule drifted to it, rode up the side of the capsule and was "grabbed" by one of the three grappling hooks on the top of the capsule (look at photos of the capsule in the water, and you'll see those hooks). --Once the capsule was "captured" and stopped by the ADDRS, the jumpmaster would begin jump procedures by dropping a spotter chute, then lining up on the spotter chute and the capsule. He'd direct the pilot to fly a straight line between the spotter chute and the capsule, and when over the spotter chute begin a count up; when directly over the capsule, the jumpmaster would reverse the count to count down, and drop a second spotter chute when he reached the last number (1). If that spotter chute landed close to the capsule, then the jumpmaster was free to jump the jumpers. --The jumpmaster would then jump the jumpers either single- or double-stick (one or two jumpers per pass), and determine whether his count was correct by their landing. Usually, this was pretty good, but in high-wind situations, the count could be quite long, in which case there was more possibility for problems. Once the jumpers had jumped, usually the jumpmaster made one more pass and jumped himself (there were no "her" jumpers when I was in the USAF Pararescue). Parascuba jump just off Okinawa, 1968. Note that this PJ is holding the right riser group in his hand, and will release it as soon as he hits the water, thereby deflating the 'chute on landing. 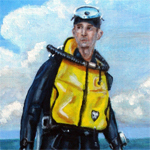 --Once in the water, the jumpers would free themselves from the parachute, dispose it in the water along with the harness (before we had an integrated parachute/scuba harness--once we had that, we would simply release the riser Capwell quick release and swim to the capsule). Then they would swim the capsule, and begin pulling in the ADDRS kits. One side had the capsule floatation collar, and the other a seven-man life raft plus survival equipment. Once the kits were alongside the capsule, the PJs would initiate placing the floatation collar onto the capsule. As seen in this film, this procedure would take about 10-15 minutes. Once inflated, the life raft would also be inflated and attached to the front of the floatation collar at the capsule's hatch. --Once all this was done, the capsule hatch could be opened and the astronauts could get out. In the film, you will notice that the CapCom person stated that the capsule was in "Stable One" position. This means that the top was where the top should be. There is also a "Stable Two" position, where the top is submerged and this is very uncomfortable for the astronauts (face-down in their harnesses). The three floatation bags that were inflated, and you can watch inflate with the CapCom commenting that they appear to be "Sixty percent inflated" are there to right a capsule in the Stable Two position, or keep waves from tossing it into a Stable Two position. Apollo 11, which was well-handled by the U.S. Navy. If you look at the floatation collar itself, you need to recognize that there is below the water line a very similar line and attachment that keeps the capsule "collared" by this floatation system. What is so remarkable about the splashdown of Apollo 13 is that, with this emergency, and with a sextant and slide rules, the astronauts brought this capsule down within four mile of the aircraft carrier recovery ship! This, to me, was astounding! Had the capsule been over about fifty miles away from this carrier, we in the USAF would have had that mission. The only Apollo mission we got was Apollo 1, which was unmanned and showed the need for the ADDRS system to be developed. What is so remarkable about the splashdown of Apollo 13 is that, with this emergency, and with a sextant and slide rules, the astronauts brought this capsule down within four mile of the aircraft carrier recovery ship! In 1970, after Apollo 13 was crippled by the rupture of a Service Module oxygen tank, Jack Swigert's Speedmaster was used to accurately time the critical 14-second burn using the Lunar Module's Descent Propulsion System, which allowed for the crew's safe return. In recognition of this, Omega was awarded the Snoopy Award by the Apollo 13 astronauts, "for dedication, professionalism, and outstanding contributions in support of the first United States Manned Lunar Landing Project." Obviously, a means of timing things was critical for Apollo 13. I had thought that was handled through CatCom with Houston; I was wrong. I just realized that this critical burn was when the crippled Apollo 13 spacecraft, with the astronauts in the LEM "lifeboat" occurred when they were out of communication with CatCom in Houston, behind the moon. Had this burn not worked, the Apollo 13 astronauts would have been in a perpetual orbit around the moon. With this burn, they were slung around the moon and headed back toward the earth. That's how critical this burn was to their safe re-entry to the earth's atmosphere. And Houston did not know if it was a success until several minutes later, when they regained communications with the Apollo 13 astronauts. That is why you heard Mission Control state that people were again breathing (in fact cheering) when they finally heard of the successful burn on the Lunar Module's engine, a burn it was not designed to do. John, do you recall, that Apollo 10 was: CSM-Charlie Brown, LM-Snoopy. These names were the last straw for NASA brass, and they demanded that they have serious-manly-names there after. Apollo 9, was: CSM-Gumdrop, LM-Spider, that really put them into a spittin'-tizzy! I've seen the movie "Apollo-13" many times, very good film, but having read the book too, they didn't show just how bad things were up there: it was far, far worse than was showed. Ty, do you have a Speedmaster, I know you're a watch-junky! No Speedmaster, just a bunch of divers. They’re super cool though, just never pulled the trigger. I was not aware of the naming situations, but above is a photo of Apollo 9s Spider while in orbit. But I can really see how Gumdrop and Spider came about. Th A's what they look like! But I thought that the luner lander trainer was also named "Spider." Neil Armstrong had to eject from one of the trainers at one point. I read The Right Stuff and I really enjoyed it until I read more from the actual astronauts points of view. Yeah, Armstrong seemed like a pretty neat guy: unfortunately, he made things look easier than they were. Then we have time: it will always degrade even the most significant achievements. Have you seen Fist Flights? It's a TV show from the early '90's: Armstrong is the host. They have lots of really funky old birds and they fly them too. Do you know who Glen Curtiss is?